public, what we have achieved and to give sight and opportunity for our members to influence our work going forward over the next year. 2017/18 has been a phenomenal year for our little charity. Our membership has continued to grow and we have been delighted with the level of input form members contributing to our work and development. It is your ideas encouragement and continuous support that keep us going & focused on the work that we need to continue to do. Please down load our annual report. We are delighted to announce that the Johnny Ruttledge Memorial Award 2015 was awarded to Mark Gilman at the 7th UK Recovery Walk in Durham on Saturday 12th September. The award recognises Mark’s significant contribution to the UK Recovery Community through leadership, love and service. Mark was one of the original harm reduction pioneers in the North West during the 1980s and in his National treatment Agency role was also instrumental in bringing together and giving a voice to individuals in the North West a decade ago who were asking if there was more to treatment than staying alive, keeping out of jail and being HIV-free. After swimming against the policy tide for a number of years, his leadership helped create the necessary tipping point so that initiating recovery became the explicit aim of treatment services. In his Public Health England role, Mark has moved the treatment and recovery support field forward by being able to clearly articulate what is required for recovery within a public health narrative, for example the essential role of positive social networks and asset based approaches. His promotion of peer led interventions has helped to make recovery visible both within treatment services and the wider community. We are particularly grateful to him for his outspoken promotion and defence of 12-step recovery, helping to mainstream it as a valid pathway to recovery among professionals. Mark has retired from his role as Strategic Recovery Lead with Public Health England in July 2015. The award is a fitting way to recognise and thank him for his significant contribution to the UK Recovery Movement and we wish him well with his new venture, “Discovering Health”. We wanted to firstly let you all know a date for your diary, (25th July) and secondly, officially invite you to our AGM & 2016 Host Winners Party. As many of you know the aim of the charity is to bring recovery out in the open and, in particular, to make it visible to families and individuals who are still suffering. We aim to do this in a variety of ways. One of these is by hosting The UK Recovery Walk every year in a different host city or town. We only had one note of interest this year to host the 2016 UK Recovery Walk – and are not therefore required to take a vote by the members of the charity. We have since had enquires from other interested parties but unfortuely they missed the deadline date, but they wont make that mistake again next year. 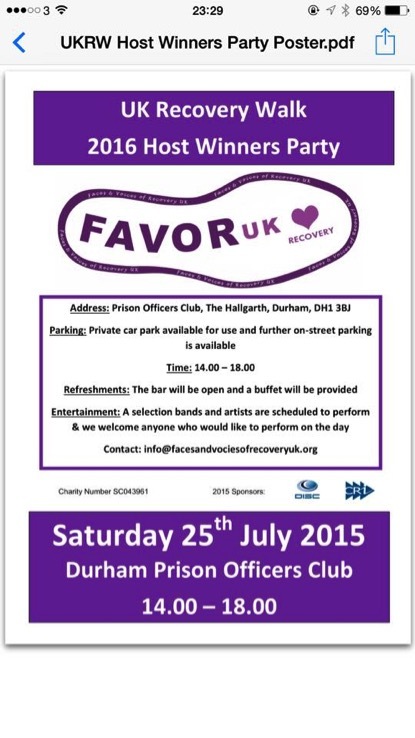 We would love you to come along and enjoy the event, meeting friends old and new, and celebrate recovery. We would be delighted if you would bring along your friends of recovery too, who will be able to find out a bit more about the charity, its work, its ethos and our trustees. There will be a variety of entertainment throughout the day and we if you’re interested in performing on the day please get in touch too. We’re inviting people in the industry, in recovery and from private and public sector from around the UK. It’s sure to be a very exciting day. We cant wait to see you – Its going to be a exciting day. The 26th International Recovery Month now draws to a close which saw people across the UK organising at least 150 local events from Aberdeen to Bristol celebrating the fact that recovery from addiction to alcohol and other drugs is a lived reality in their lives (compared to around 100 events in 2014). The highlight of Recovery Month in the UK, and the largest gathering of people in recovery in Europe, is the annual UK Recovery Walk. This year the 7th UK Recovery Walk was held in Durham, writing another chapter in the history of addiction recovery in the UK. At the recovery, spirituality and families conference in Durham Cathedral the day before the walk and the walk itself on Saturday 12th September, we went some way in the North East and across the UK to challenging the social stigma attached to addiction experienced by families, organisations, fellowship programs , neighbourhoods, and whole communities. Many of us have, for too long, knelt with bowed heads, not in humility or prayer, but in shame. The UK Recovery movement has matured further this year during International Recovery Month. As in our personal recovery, masks of arrogance and intolerance give way to greater humility and acceptance and as a movement overall we have celebrated greater unity in strength and experienced greater strength in unity inspiring our friends and allies in Australia and South Africa to take their respective movements forward too . When we learn in recovery about accepting the imperfection in ourselves, it becomes easier to forgive what we see as imperfections in others, some of which later become understood not as imperfections but difference. We celebrate with FAVOR every year that differences cease to be a threat, and we experience true joy for another whose pathway of recovery is different than our own. During International recovery month we had the opportunity to publicise that when we stop claiming that our way is the TRUE way and instead claim only that it works today for us & celebrate all the pathways to recovery. There have been many people who have worked tirelessly all over the UK to make sure recovery month events went off without a hitch but with much fun and many games, with many people gaining new skills and friends along the way. It’s fantastic to see it go from strength to strength. With the conference and with the 7th UK recovery walk in Durham this year – many of the people of the North East got to know, see and feel what recovery is. As a charity we are grateful for that and even more so for how the people of the North East worked with, cared and loved us at the charity. It has been a superb year and we will desperately miss you all. Next year’s UK Recovery Walk will be held in Halton. We are also now open to notes of interest and applications for the hosting of The UK Recovery Walk in 2017 – see here for more details. Our sincerest and deepest gratitude goes to every single person here in the UK & across the world that played a role in International Recovery Month this year. Save time, save lives… You will learn more from this intense fully-rounded ‘crash course’ in how to recover from addiction than you could from months of research. Our expert presenters cover topics ranging from the basics to neuroscience to mutual-aid groups, from factors influencing the elderly to youngsters, LGBT, BME and much more. Join us for quality training in a quality environment! Break the intergenerational chain: accelerate addicts into recovery. Families often reach ‘rock bottom’ before the addict does, and are first to recognise addictive behaviours. Research also shows that, the longer people go without treatment, the harder it is to start the process of recovery. At Interventions Plus, you can learn solutions from established, expert interventionists simultaneously strengthening your support network. Start collecting your CIP (Certified Intervention Professional) education credits/hours to be formally accredited. Register here at the link below. 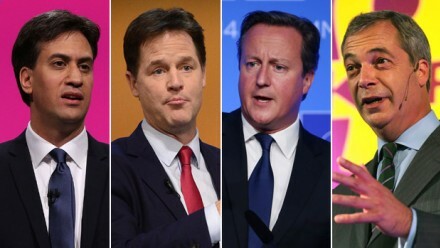 Are you voting on May 7th 2015? One of the gifts of recovery is enjoying the rights and responsibilities of being a productive & contributing member of society. One of the benefits of being an active citizen in the UK is being able to vote. 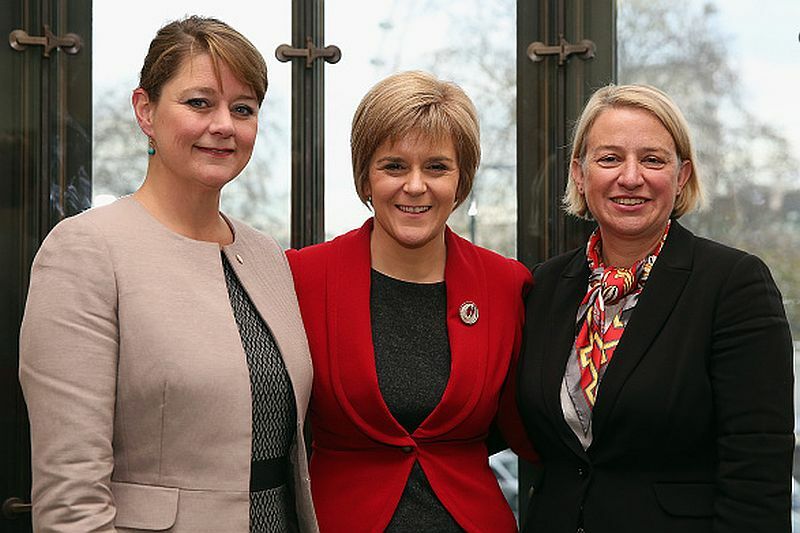 If you have registered to vote before 20th April you will be able to vote in the UK General Election on 7th May 2015. Ask them and the other candidates where they stand on the other issues that you care about most and use your vote. We have been through the election manifestos of the main political parties in the UK and pulled out any references to policies on addiction and recovery below. Please let us know if we have missed anything you think should be included. “Now in its 25th year, international Recovery Month raises awareness of substance use disorders and promotes the societal benefits of prevention, treatment and recovery support services. Throughout September thousands of people across the UK have organised local events celebrating the fact that recovery from addiction to alcohol and other drugs is a lived reality in their lives. Recovery Month celebration events have grown beyond what anyone could have predicted here in the UK with an estimated 100 events taking place across the country in 2014. Local recovery celebration events that once welcomed a few dozen brave participants grew into the hundreds and then into the thousands. Each one is stepping forward to challenge the degrading public stereotypes attached to addiction – and together stepping forward to put a public face on addiction recovery. The highlight of Recovery Month in the UK is, of course, the annual UK Recovery Walk. This year in Manchester, several thousand people in long term recovery, their friends, allies and families, made visible the viable and varied recovery solutions for alcohol and other drug problems – the largest gathering of people in recovery in Europe! Next year’s UK Recovery Walk will be held in Durham. We are also now open to notes of interest and applications for the hosting of The UK Recovery Walk in 2016: see here for more details. 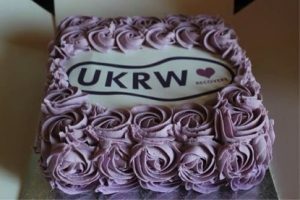 The host city/town for the UK recovery walk is decided by a vote by UKRW members each year. It’s easy and free to become member. The UK Recovery Walk charity is the only organisation in the UK with an explicit mission to respond to the organisational and leadership development needs of grass roots addiction recovery community organisations, and to develop and unify addiction recovery advocacy in the UK. Our latest resource, A Toolkit for Recovery Advocates in England, has been produced to support the work of those involved in local advocacy work for prevention, treatment and recovery support services in England. It was launched at our “Advocacy in Action” conference, hosted by Manchester Metropolitan University the day before the UK Recovery Walk in Manchester and is available as a free download here. So as we mark the 25th anniversary of International Recovery Month, it is important to recognise why public education and policy advocacy is so important. All over the UK we are, as people in recovery, living lives of restored health and community service who, even as little as 50 years ago, would have died or been subjected to jails & other institutions. We thank and are deeply grateful to all our professional and volunteer friends who helped create and are trying to protect the environment where this is possible. We also honour your years of dedicated service during this month of recovery education and celebration.